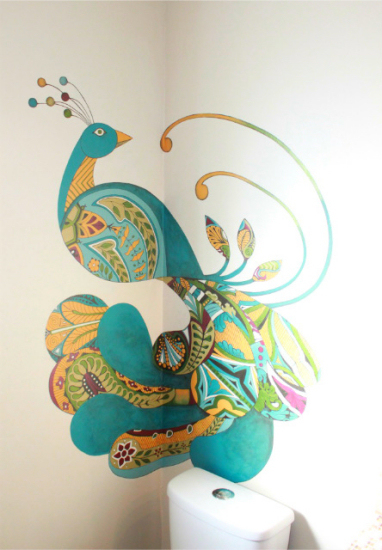 This amazing peacock mural is from The Rooster and The Hen. What amazing color, texture, and pattern it adds to this bathroom! 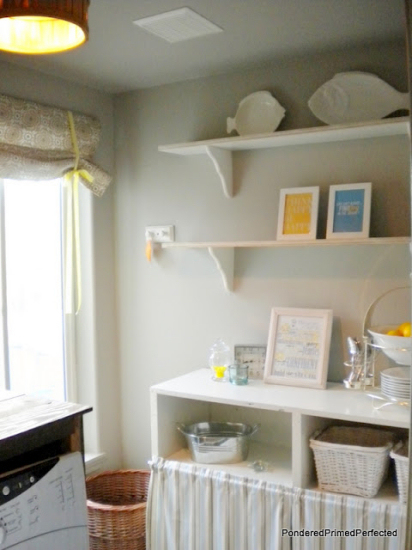 Laundry room makeovers always catch my attention because I long for a laundry room of my own! This fantastic makeover is from Pondered Primed Perfected. All of the details are just wonderful…especially that light! I’ve had many people ask me how to recover a lamp shade with a wire frame, but it’s a task I’ve actually never attempted because it looks intimidating to me. But Beyond The Screen Door was up to the challenge, and even shares pictures of the process. 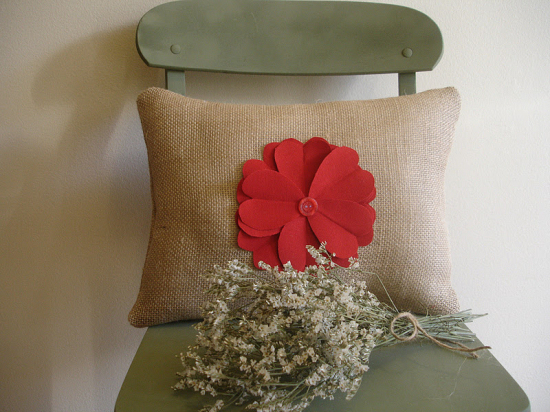 The pretty flower on this pillow is made of…(can you tell?)…hearts! Isn’t that clever?! Head over to Don’t Disturb This Groove to see the details. What a fantastic idea for small dogs…or perhaps even cats. Turn unused drawers into dog (or cat) beds! 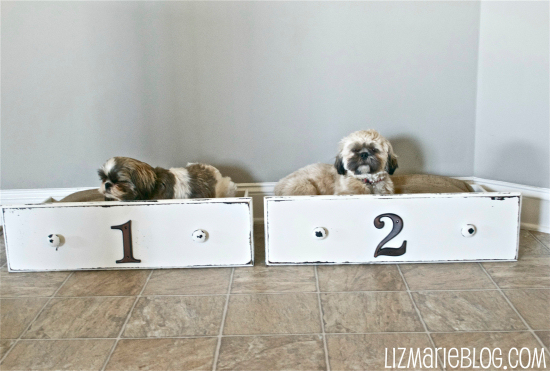 What a simple and brilliant idea from Liz Marie Blog. 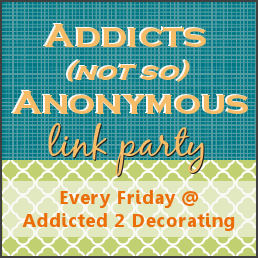 There’s plenty more to see from last Friday’s link party! And don’t forget, if you want to show of something you’ve been working on, the party starts on Friday at 1:00pm! Next Post Out Of Curiosity:: Painted Or Stained Kitchen Cabinets? Those drawer dog beds are too cute – I may have to get a dog now! I LOVE Downton Abbey. I really liked the first episode, and by about the 3rd or 4th I was completely hooked. Maybe you should try a couple more episodes? If you don’t like it though, who cares? You should watch what you love (personally, I don’t care for The Office, no matter how many times I try to start at the beginning – and people rave about that show, too). 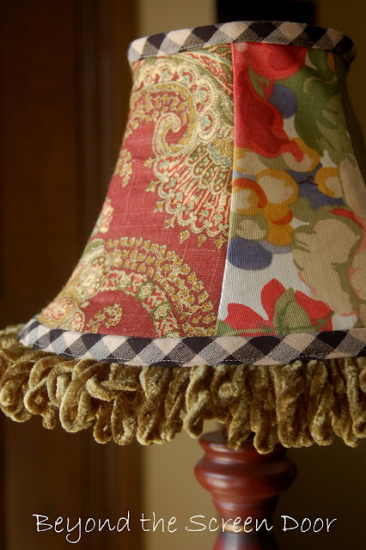 Now, time to check out that lampshade…. I’m with you on football. I haven’t watched Downtown Abbey so I can’t comment on that. These dog beds are too cute… but I don’t think they’d work for mine. She’s a dalmatian/whippet mix and weighs about 100 lbs. I got hooked on DA once this season started up….I had read so many good reviews of it, I thought I’d check it out. I am HOOKED! It’s been described as “a good period drama” and I agree. I love historical fiction and it’s interesting to see what a different time that was. It’s kind of like a historical soap opera and I got sucked into the characters. : ) Now I’ve bought the first season on iTunes and am planning to catch up! Hi Kristi! Thank you kindly for featuring my pillow! I am not a football fan, but my husband is. Needless to say the Superbowl was on over here. I just watched long enough to see Madonna perform. Then I watched Shameless on HBO! I heart Downtown Abbey! I watched the first season on Netflix. And despite everyone’s disdain for Netflix, I absolutely love Netflix! My absolutely favorite show is Once Upon a Time from ABC and Psyche on USA Network. I am also in love with the new Dr. Who and The Walking Dead from AMC. Netflix has all of those shows except for Once Upon a Time, which is probably why I love Netflix so much. It was quiet around here, too during the Superbowl. I’m not a huge fan of sports so that was fine with me:) The hubby managed to get home in time for the last several minutes, though.